The People’s Liberation Army-Navy (PLAN) is here to stay in the Indian Ocean and its military movement has fuelled concerns about China’s intent in the region, India’s senior-most military commander has said. 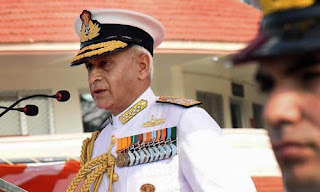 Navy chief Admiral Sunil Lanba said the Navy is keeping a sharp eye on “the pattern and periodicity of extra-regional deployments” in the Indian Ocean Region. A fleet of 50 combat-ready Indian warships is carrying out round-the-clock surveillance, he said. “Their (PLAN) headquarters is now used to handling forward deployments. Over the last decade, China has developed the capacity to operate its warships at a great distance from its shores and for long periods of time,” Lanba said in an interview. He is the country’s top military leader as chairman, chiefs of staff committee — a panel consisting of the three service chiefs. Lanba’s comments come at a time when China’s growing military assertiveness in IOR is being discussed internationally. There were tensions between the US and China last week, with the Trump administration accusing China of directing powerful lasers at US aircraft flying over a Chinese military base in Djibouti. The navy chief said China had “deeper pockets” than India and it was “going about systematically” increasing its presence and investments in the region. “There is a degree of debt-dependence of countries such as Djibouti on China,” Lanba said. China began deploying troops to its first overseas naval base at Djibouti in the Horn of Africa in July 2017, in what some global experts said was the outcome of Beijing’s “debt-trap diplomacy”. Mounting debts have led countries such as Sri Lanka, the Maldives and Pakistan to give control of territories, which are of strategic significance, to China. The base in Djibouti has shored up China’s capabilities to sustain naval units in the Indian Ocean. In February, Lanba cautioned “weaker nations” to be watchful of the “intent under the garb of cooperation” of their economically and militarily superior partners. “China is very focused on the IOR to secure and further its national interests. And for this, it will strengthen and use its naval power,” said Sudarshan Shrikhande, a retired rear admiral. He said China would become a more capable and versatile sea power in the coming years and India would have to do a lot more to sharpen its naval edge. Lanba said the pattern of deployment of Chinese warships in the IOR was being mapped. “At any given time, they (China) have six to seven warships deployed in the region. Also, they send two conventional submarines to the area every year. This year we have detected no submarine movement,” he said, adding that the Indian Navy was focused on extending its own sustenance and reach in IOR.